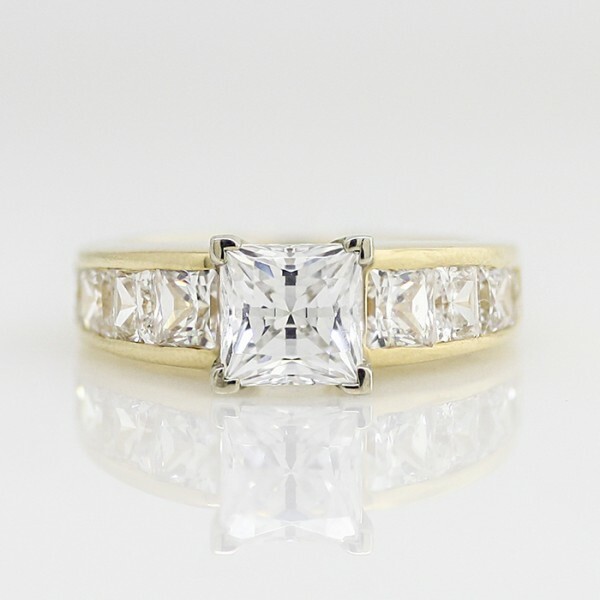 Retired Model Escada with 1.96 carat Princess Center - 14k Yellow Gold - Ring Size 6.0-9.0 was added to your cart. A solid row of channel set Contemporary Nexus Diamonds framed by smooth ribbons of metal make the Escada engagement ring blinding. The thicker band adds a feeling of weight and a heavier look to this sturdy ring. The smooth profile of the band features a notch where the setting of the center Nexus Diamond fits snugly, making this a lower-profile ring that won't snag easily. This is an older version of our Escada engagement ring. It may not fit well with a Escada matching band.